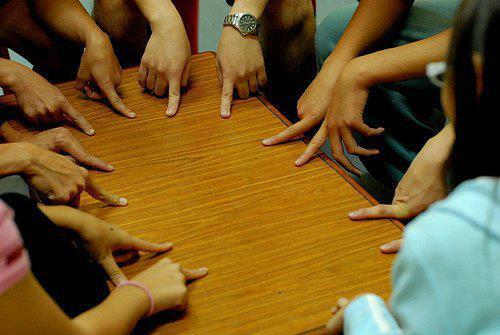 If you have done any part of your education in a school in India, then I am sure you must have played this crazy game at least once in your life! Be it a free period in school, or a traffic jam at the railway crossing on your way back from school, or a power failure at home, 'Chidiya Udh' was one of the most popular games among friends and siblings! I remember my childhood days, when the school bus used to be so crowded that we had to stand in the central aisle all through the commute. Even then, we never let go of an opportunity to play 'Chidiya Udh'! One hand hanging on to a support railing, and the other busy flying birds and papers and ribbons and cars and elephants and... even our friends ("Swati udh")! And do you remember the cheating? At times when we raised our finger too early, and then realized midway that the object called could not fly, we tried to pretend we'd lifted the finger to scratch our nose or something! Simple though the game was, it often led to some really noisy moments! Frankly, it's quite amazing that something so silly could evoke such strong feelings in the players! I'm pretty sure that had nothing to do with being kids; I bet we'll still get as worked up about it if were to play it again now! What do you think? Have you played 'Chidiya Udh' recently? With your kids, perhaps? Or with your nieces/nephews maybe? My left hand played against my right recently. I can't type here who won without the other hand grabbing my throat. Oh you must try it sometime! It's damn fun! I can't believe you missed out on it for so long!